'This is the third release from Brighton band Kellar and once again sees a shift in theme and style with synth joining the improvised guitar and pedal drone of the previous release “Smokescreen”. There’s even some melody of sorts and tuneful rhythm from the drums at times, and although it’s still droney noise it suits more listening environments than the first two releases. The song length has plunged from an average ten and twelve minutes respectively, to around six, which means a lot more beginnings and a lot more endings and in fact one of the first things I noticed was how well the songs start and, in particular, finish compared to 80% of instrumental rock that I hear. It’s a real bugbear of mine that so many artists cannot end a song, instead falling to a post-production fade or a run-on into the next song rather than bring a song to a satisfying conclusion, yet Kellar manage very well even without a cadence readily available. Each of the ten songs carries distinct and unique motifs through them, either melodic or rhythmic, that ebb and flow through the song over a background of distorted guitar and synth-driven oscillations. The track ordering is good too with the progressions through these different themes a gradual one that suits the style of music. It’s good to see the band alter their approach for each record and with “Cell Divides” they show that an improvised drone track well under three minutes can work if the context is right. By contrast the longest of the tracks, “Shouldn’t Have Returned”, clocks in at over twelve minutes and it doesn’t work that well for me alongside the shorter songs, but listeners will make up their own minds. A highlight is the whalesong guitar that starts up in the second half of “Floats Like Spore”, drawing you into a relaxed feeling of safety before it suddenly turns into a mighty deathray that blasts you out of the ocean. That searing guitar is the link with the next song “Nothing in the Rubble” before that track introduces its own characteristics. 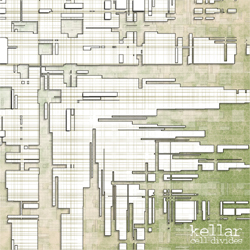 Kellar showed how well they could tell a story in a song on the last record with tracks like “The Levitation of Princess Karnak” and this time they have gone some considerable way to delivering a much broader narrative.